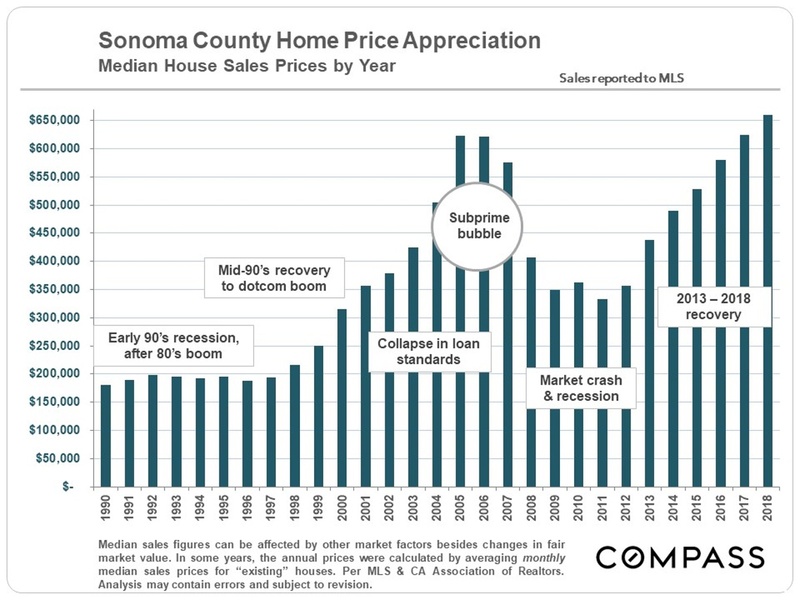 How did Sonoma’s median house prices look in 2018 …… On a quarterly basis, the median house price peaked in the second quarter and then began to drop. What’s in store for 2019 – let’s take a look at the detail. 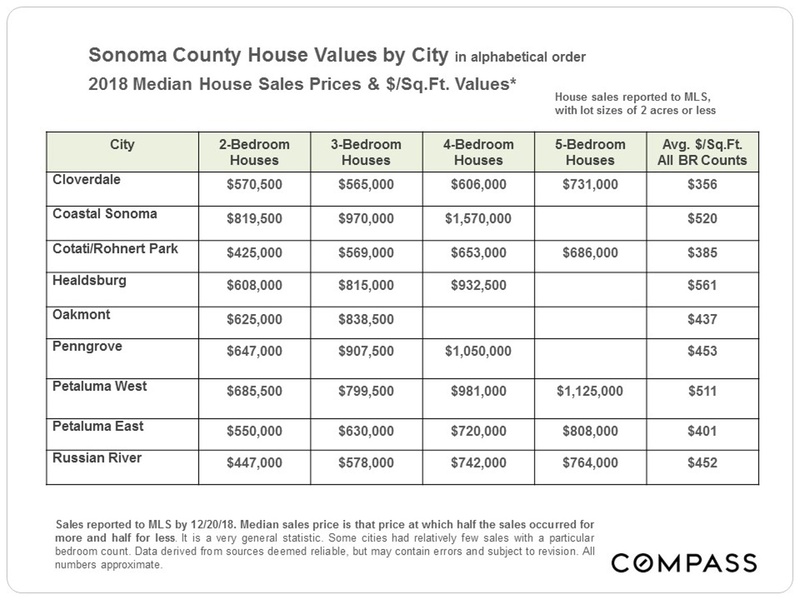 If you or anyone you know desires more information on the Bay Area Real Estate Market Activity – feel free to contact us anytime and we are happy to assist. There were almost too many political, economic and even ecological factors – local, national and international – impacting the 2018 market to count. 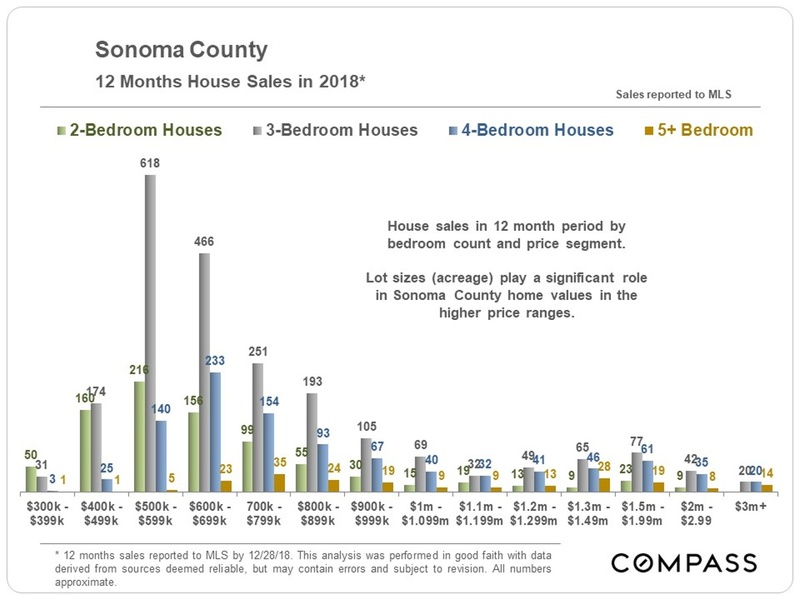 At the end of 2017 and in the first half of 2018, market conditions were very hot in Sonoma and around the Bay Area, and there were strong year-over-year appreciation rates. 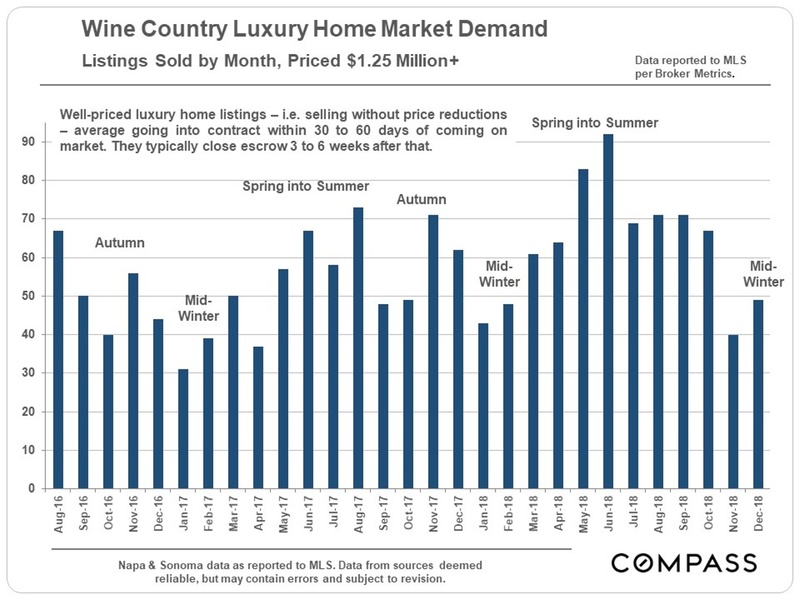 Come summer/early autumn, real estate and financial markets began to shift distinctly cooler. Looking at 2019, there are many wild cards whose impacts are difficult to predict: extremely volatile financial markets, new tax laws, fluctuating interest rates, contentious national politics, international trade issues, spiraling debt levels, employment growth – and a dramatic surge of local high-tech unicorns that plan to go public, which could create a tsunami of new wealth in the Bay Area. 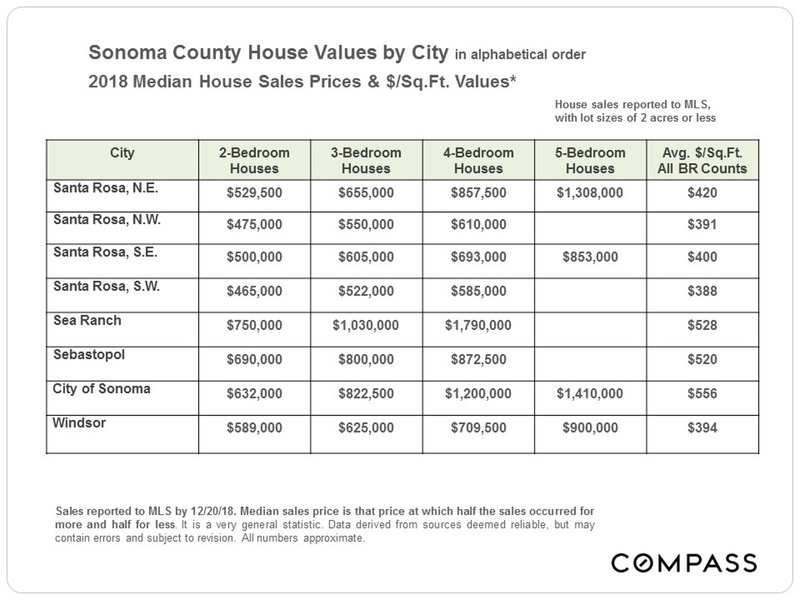 On an annual basis, the Sonoma County median house sales price increased $35,000 or 5.6% in 2018 to $660,000. 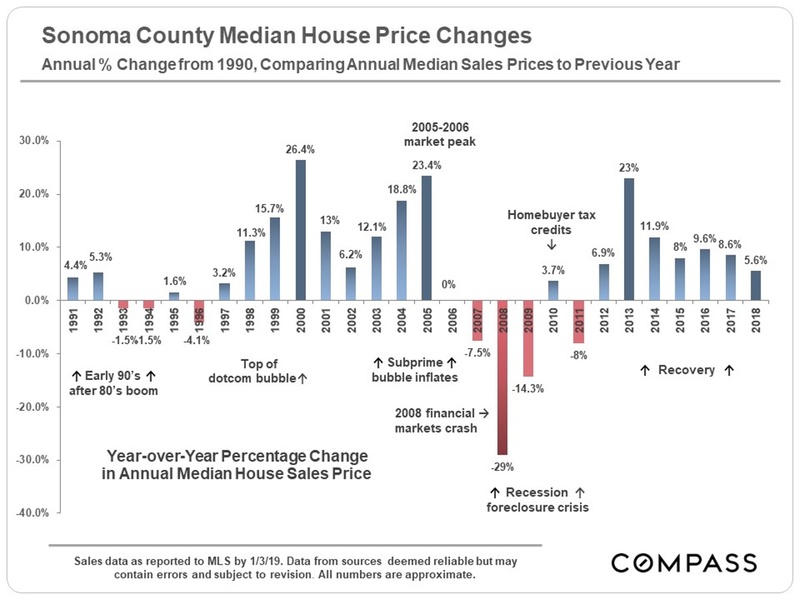 On a quarterly basis, the Sonoma median house price peaked in Q2 and then began to drop. 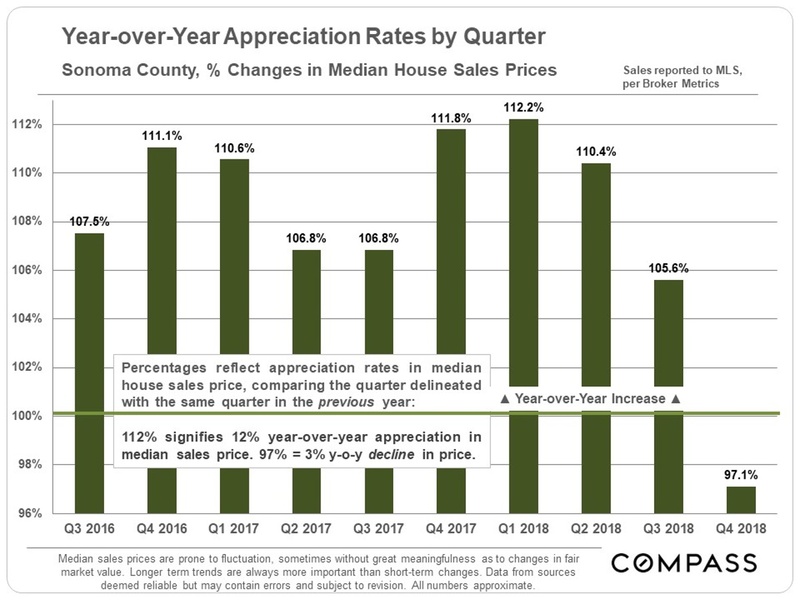 Year-over-year quarterly appreciation rates fell from substantial increases of about 12% in both Q4 2017 and Q1 2018 to a negative 3% in Q4 2018 – that is, the Q4 2018 median house price was a little below that in Q4 2017. 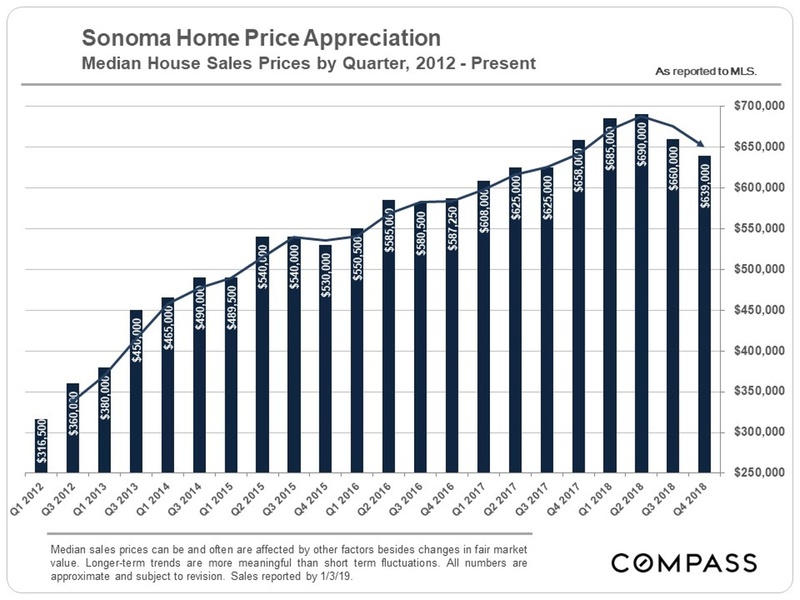 That’s a noteworthy change from recent trends, but one should not make too much of a single quarter’s data. 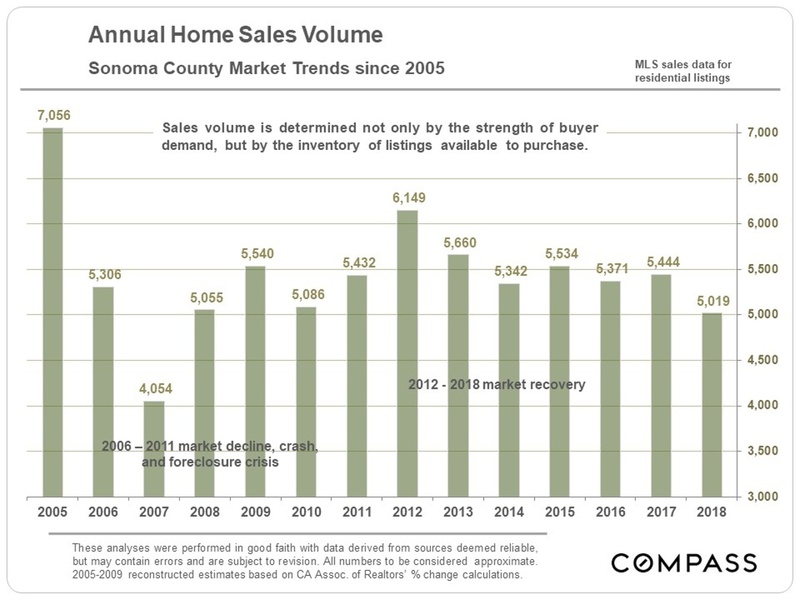 The number of Sonoma County home sales in 2018 dropped about 8% in 2018 – to an approximate volume last seen in 2010. 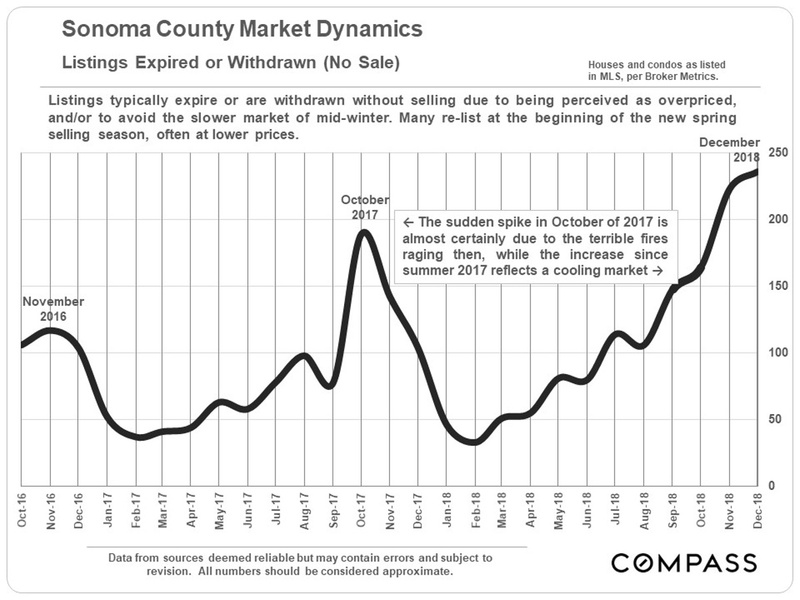 Home sales of $1,250,000 and above held up very well through October, but dropped during the last two months of the year – which is not a very long period to draw conclusions from. 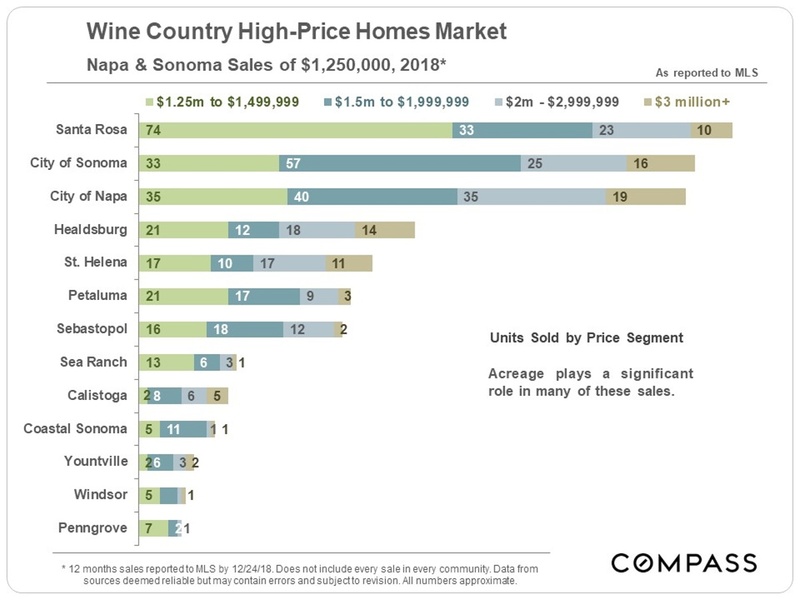 Sonoma & Napa Counties have surprisingly large ultra-luxury home markets, featuring gorgeous properties that often include considerable acreage and/or vineyards. 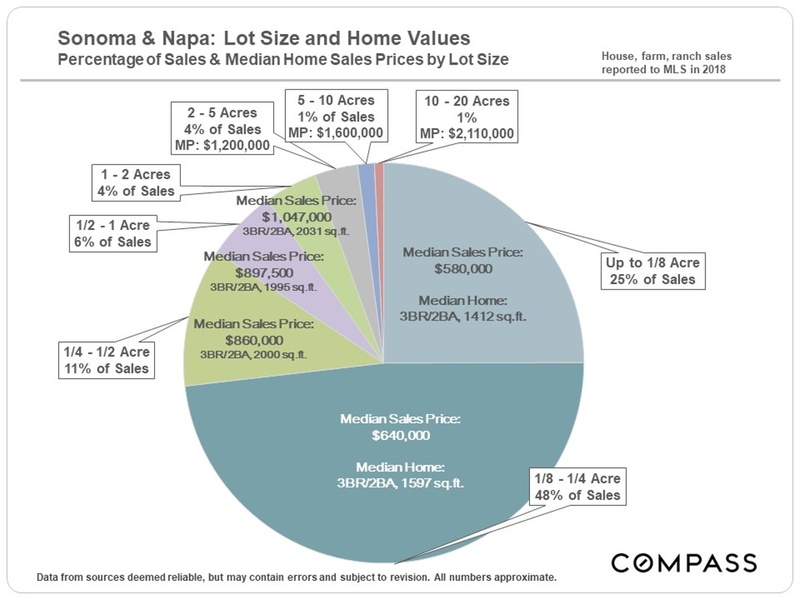 But, generally speaking, the number of such listings for sale far outpaces demand – after all, it’s a relatively small group of very affluent buyers (often looking for second homes) – so pricing correctly is an imperative. 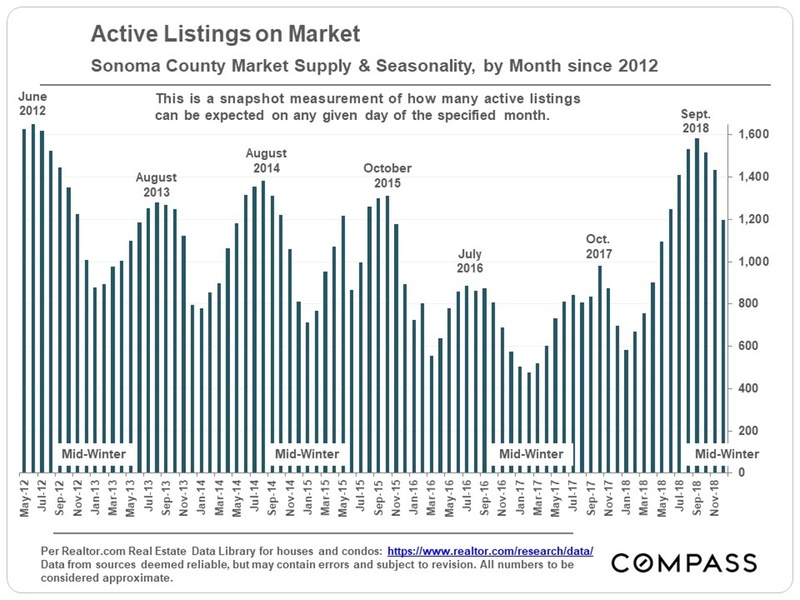 These charts glance back at monthly or quarterly trends, and besides changes in market conditions, there is the very strong influence of seasonality on real estate markets. 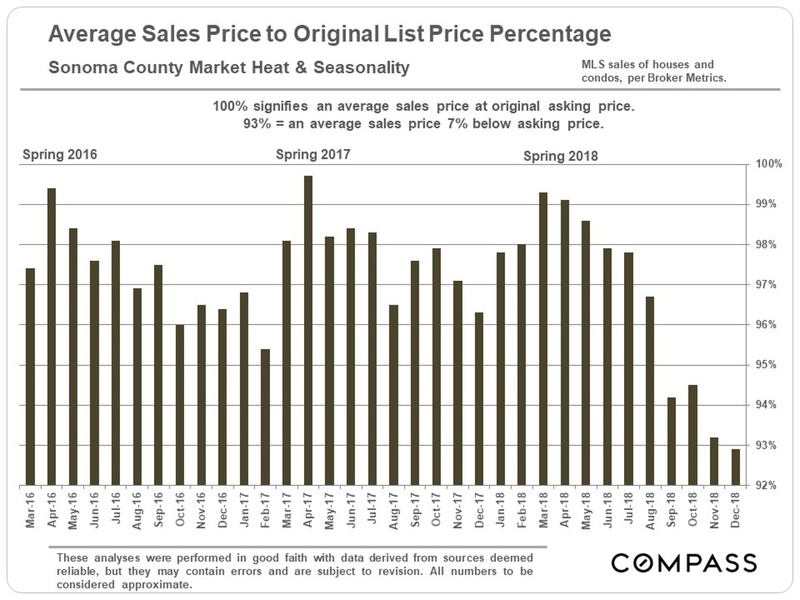 Mid-winter is the slowest time for activity, and we will probably have to wait until the spring selling season gets underway for more insight into where the market is heading. 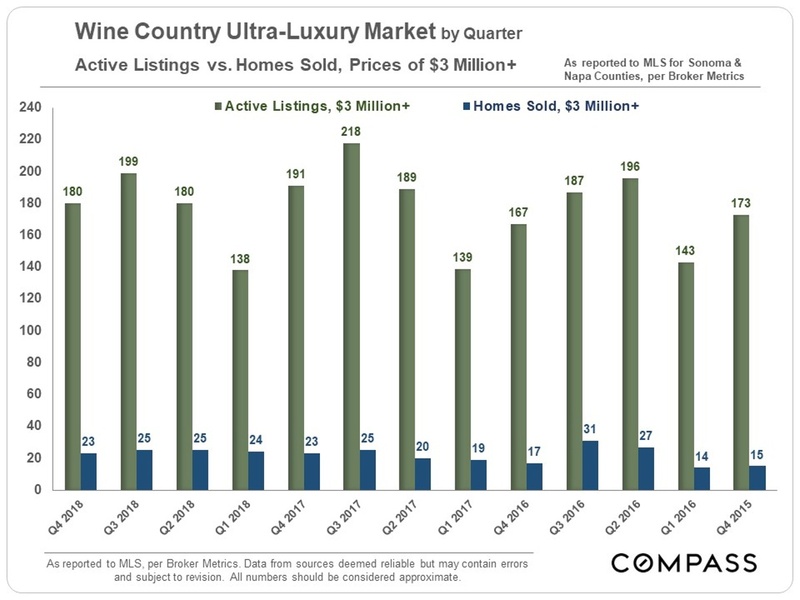 The number of active listings on the market in 2018 surged considerably over 2017 levels and are flirting with 6-year highs. 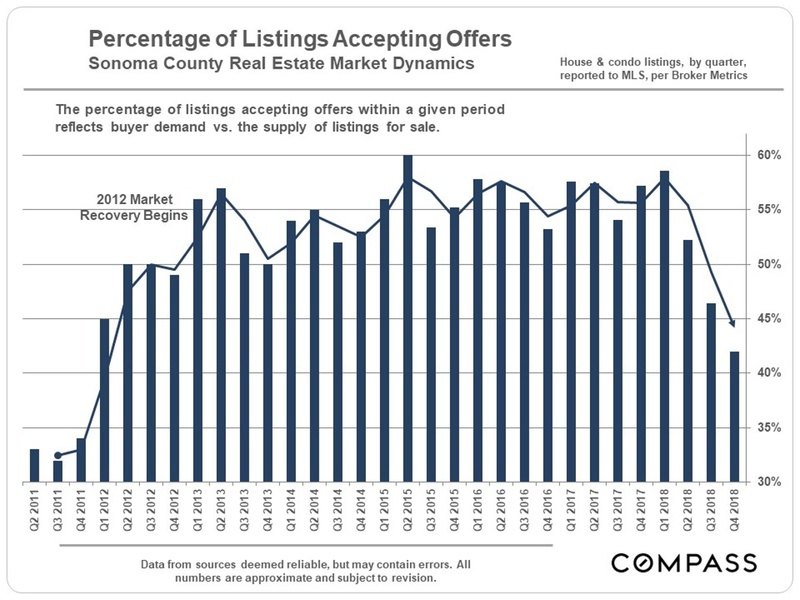 More listings and a declining percentage of them going into contract. 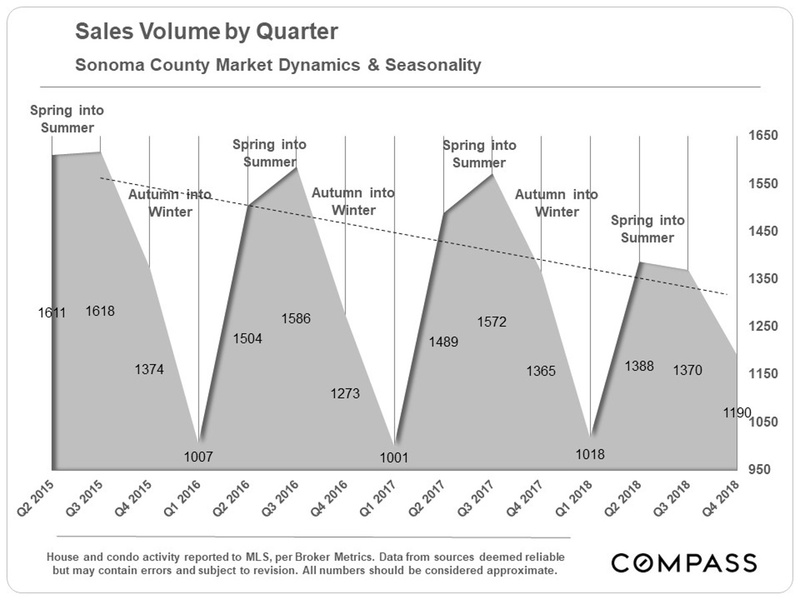 Significant year-over-year declines in home sales volumes over the last 3 quarters. 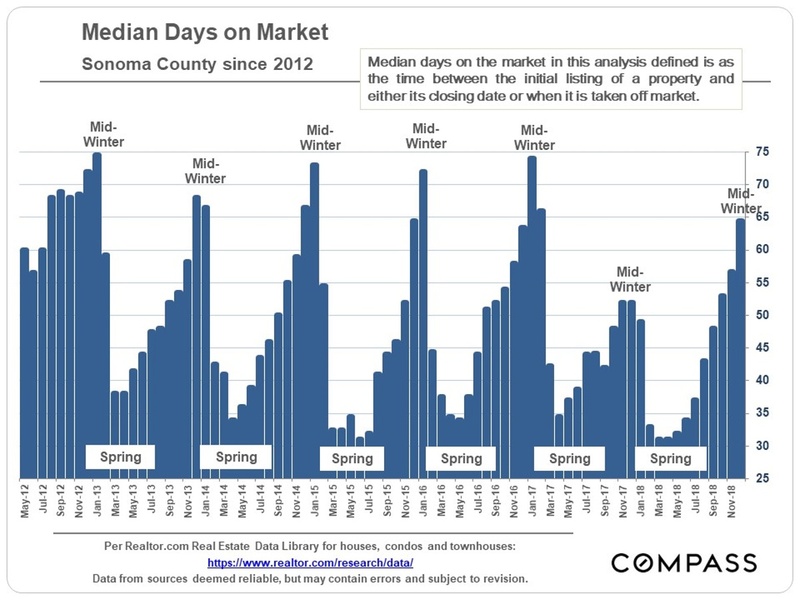 Median days on market are climbing well above the readings in 2017, but are not yet particularly high on a longer-term basis. 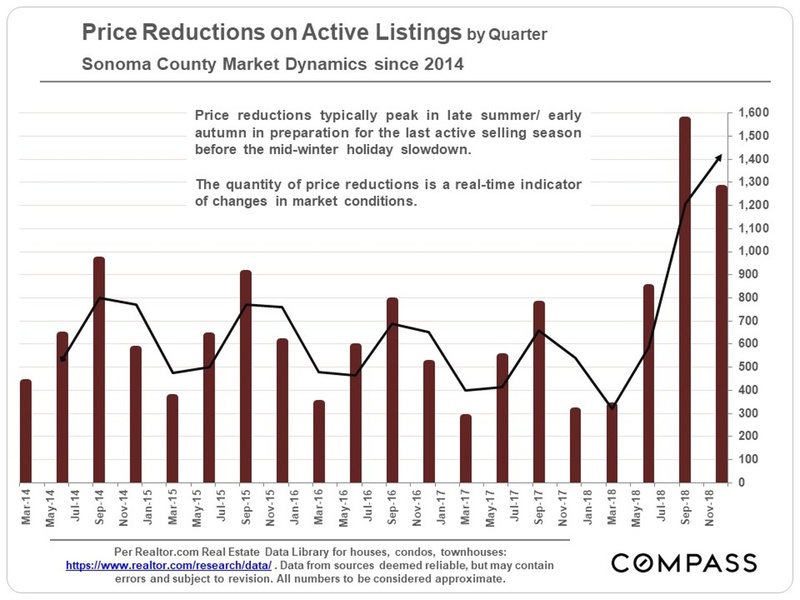 The next 3 charts are some of the clearest indicators of changes in supply and demand dynamics: Substantial increases in price reductions and expired no-sale listings, and a considerable decrease in the average sales price to original list price percentage (i.e. 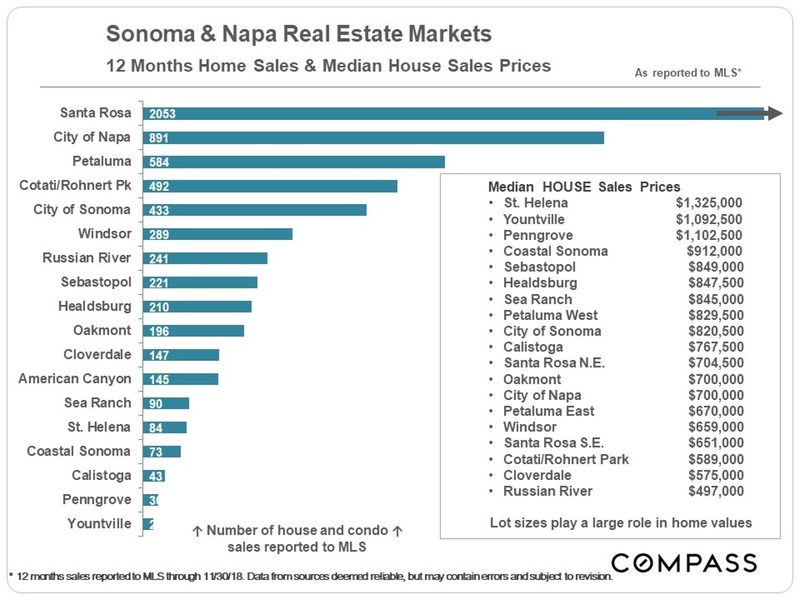 buyers are negotiating asking prices down more aggressively). After climbing rapidly through November, interest rates have been dropping through the first week of January – good news for buyers and sellers. However, rates are still much higher than the lows seen in the last few years, and predicting what will happen in the near future is very difficult indeed.